Our Lunge Strap is made in the USA out of quality double sewn nylon with large easy to use snaps. This makes it easy to lunge or lead your horse with the Dr. Cook Bitless Bridle. To convert the Dr. Cook Bitless Bridle into a halter, remove the reins. Gather the O ring on the end of the crossunder strap that is hanging on the opposite side. Bring it under the chin and include this ring when clipping the lunge strap onto noseband O ring. You will have both O rings contained in the clip. Do this for each side, Hook your lead under the chin. For Lungeing with reins removed. 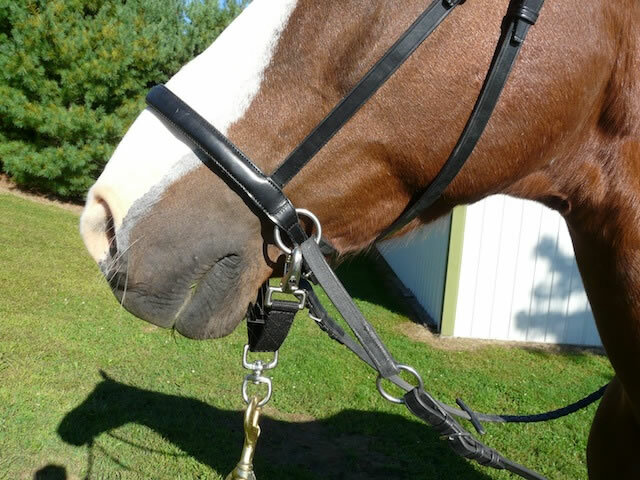 Follow the instructions to convert the Dr. Cook Bitless Bridle into a halter and clip your lunge line under the chin. This will be the most useful accessory for your Dr. Cook Bridle.